We tend to connect Brass Bands with gritty northern towns in the UK, but by way of contrast the town of Limoux (11 Aude, Occitanie), south of Carcassonne. is hosting a Brass Band Festival (Festival Limoux Cuivrée Spéciale) from 1 – 5 May 2019. Amongst the bands appearing in recent years have been the UK’s BBC Big Band, the French Band of the Republican Guard and a quintet of trumpets “Les Trompettes de Lyon“. Limoux is a good base for visiting the Pyrenees, Cathar country and the spectacular fortified medieval city of Carcassonne. Local wines include the still and sparkling white wines of Limoux (visit Antech), and further east you enter Corbieres country. 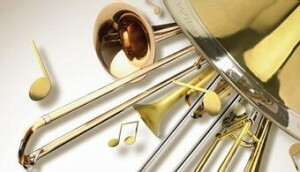 Interesting that the French refer to Brass in this context as “cuivrée” which is more literally “coppered” – in general the term “brass” does not necessarily imply that the instrument is made from brass, but it belongs to a group of instruments where the sound is made by “lip vibration” – and of course includes the Saxaphone which is promarily made of wood. Presumably the same applies to the French use of the term “cuivrée”!